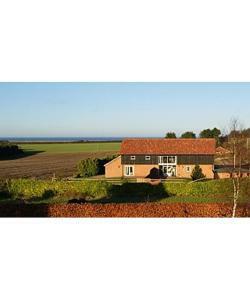 Rectory Hill Barns01263 741138work Self-cateringOnly 2 1/2 miles from the picturesque market town of Holt, renowned for its lovely shops and eateries, and five minutes drive from the beach at Cley; this our larger barn conversion, "Lapwing" offers unrivaled comfort and space. There are 3 large bedrooms all with space for extra beds or cots and the principle has a balcony with views of Blakeney and the sea. Downstairs is a spacious kitchen with all the modern conveniences you would expect, an ample dining wing and separate cloakroom. The 2nd double room, also with en-suite and a further twin-bedded room compliment the accommodation. We are also able to offer our quests a large wet-room where kids and adults alike can freshen up after a day at the beach. This is too a good facility for guests with limited mobility. Finally Lapwing also has a playroom with toys and games for all ages plus a pool and table tennis table if the weather is not perfect enough for bracing walks or trips out to Blakeney point to see the seals! Both our barns have unspoilt views of open countryside, are set down a long drive and have private fenced gardens, making this a very peaceful place to stay. Only 2 1/2 miles from the picturesque market town of Holt, renowned for its lovely shops and eateries, and five minutes drive from the beach at Cley; this our larger barn conversion, "Lapwing" offers unrivaled comfort and space. There are 3 large bedrooms all with space for extra beds or cots and the principle has a balcony with views of Blakeney and the sea. Downstairs is a spacious kitchen with all the modern conveniences you would expect, an ample dining wing and separate cloakroom. The 2nd double room, also with en-suite and a further twin-bedded room compliment the accommodation. We are also able to offer our quests a large wet-room where kids and adults alike can freshen up after a day at the beach. This is too a good facility for guests with limited mobility. Finally Lapwing also has a playroom with toys and games for all ages plus a pool and table tennis table if the weather is not perfect enough for bracing walks or trips out to Blakeney point to see the seals! Both our barns have unspoilt views of open countryside, are set down a long drive and have private fenced gardens, making this a very peaceful place to stay. Cycle storage available Children welcome from any age.